One of the most helpful things our customers can do for us is to leave us reviews online. 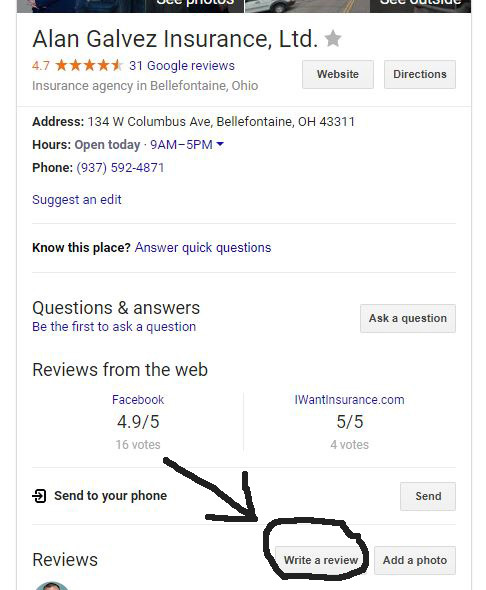 This helps us tremendously in terms of people finding our agency online when they search for a local agent. If you have a moment, we would be extremely grateful if you could leave us a Google Review. 1. Click the Leave a Google Review button below. 2. Click the Write a Review button. 3. Choose the number of stars, type your review into the box and click Post. That's it! After being with our previous insurance provider for thirty years, we finally realized we needed to do some comparison shopping for rates. We are so glad that we did and that Alan Galvez insurance was one of the places we shopped. We saved money on both our Home and Auto policies and the savings on our Autos was a very significant amount to what we were paying before, plus we got higher insured value on our home and autos. I would encourage everyone to take the time to check into their insurance needs with Alan Galvez Insurance. The staff is more than friendly and helpful and they will find the insurance that fits your needs. I know we are very glad we checked with them. Where do I begin.......Carie went above the call of duty last night. How I appreciated all she did in a time of crises for one of my clients. She went out of her way to take care of my client's needs after hours. She truly is committed to taking care of people, no matter what time of day it is. Thanks Carie. I HAVE BEEN WITH GALVEZ INSURANCE AND HAVE EXPERIENCED NOTHING BUT PROFESSIONALISM AND CARING. RETIRING TO BELLEFONTAINE FROM NEW YORK ABOUT 14 YEARS AGO WE LUCKILY WERE REFERRED TO ALAN. HE HAS ALWAYS HANDLED OUR INSURANCE NEEDS WITH CARING, SPEED AND THE LOWEST PRICES THAT FIT OUR REQUIREMENTS. AS A RETIRED TAX ATTORNEY I WAS NOT USED TO SUCH CARING AND EFFICIENCY BY ANY OF THE INSURANCE PROFESSIONALS THAT I DEALT WITH FOR MYSELF AND MY CLIENTS. THANK YOU ALAN FOR ALL YOU DO FOR EVERYONE IN BELLEFONTAINE. We recently just purchased new home and auto policies and were so pleased with the helpfulness and kindness of Trevor. He answered all questions, gave us different options and got back with us in a very timely matter on all changes we were making. Carrie is a great lady to work with. We don't feel like we're a "number". We feel "known" and appreciate the personal attention to our needs. We've been clients for 20 years and have always received a friendly and helpful attitude. When we've had offers to compare rates, we've found what we have through Alan Galvez Insurance to be lower. In Sept 2010, our barn and garage were demolished by straightline winds of over 60 miles an hour. There was also hail damage to the siding on our home & out building. We called Alan and he rode his motorcycle out to our home and took pictures that evening. The next day an adjustor came, she was very knowledgeable and nice to deal with. Within 3 days, we received a check to cover the damage. It just doesn't get anymore personable or better than Galvez Insurance. Years ago my husband was out of town and we had a downpour of rain. Massive amounts of water filled my garage and tried entering my house. Alan came over to our house and helpef by digging a trench in our driveway, averting the water away from the house. Alan made a traumatic event much easier to handle. We came to Alan Galvez Insurance scared and worried about finding Health Coverage for our family. Carrie sat down and gave us one to one care that we had not experienced at other offices. That was four years ago and since then we have transferred our home and auto policies as well. Recently we had a claim on our car and again she was there for us- no hassles, no worries. Thank YOU! A policy with Galvez Insurance is an assurance that your house and vehicle needs are covered. A year ago my family received new premiums from our long time agent and the increase was more than what we felt was a normal increase. At that time, Ray immediately went to talk to Alan, a lifelong friend. Alan was immediately at the house getting details needed to write our policy. After providing Alan with our vehicle and motorcycle details, we had a quote that was lower than our previous rates with more complete coverage. Since then, we have referred others to Galvez Insurance. After the recent storm, our roof and yard received some wind damage. Alan was out immediately and on the roof taking photos and started the claim. The adjustor was just as timely in coming to our house and we have our check and a new roof will be completed at the end of the week. We always feel like we are the only clients and always the most important clients each time we make a call. We believe in the people and the reputation at Galvez Insurance. Carrie has been exceptional in all aspects of my insurance needs. She spends a lot of time answering my questions, and if she doesn't know the answer she will research until she finds it! She is very easy to work with, and has an awesome personality, which is very refreshing in the insurance business world. I highly recommend Carrie to any one shopping for insurance needs. I had been with the same insurance agency for years and wasn't satisfied. So I contacted Galvez Insurance to see what they could do for me. They saved me money plus showed me I was underinsured. I have recommended them to friends as it's the best, friendliest service I have ever gotten from an agency. I recently had questions about a policy that wasn't with them but with another agency for a person I assume guardianship of. They answered all the questions for me without hesitation. The entire Alan Galvez Insurance Agency staff is like no other. Treating each customer like family is on top of their priority list. I'm so grateful for their quick action when problems arise. Paperwork is completed in minimal time and someone is always available to talk one-on-one about any issue or concern. Logan County is blessed to have wonderful insurance agents with such high standards! I would highly recommend Carrie and the Alan Galvez Insurance Agency. Carrie is a hard worker, detail oriented and is of excellent character. Carrie and her family have volunteered for years at the Logan County Convention & Tourist Bureau and I am proud to know them. I have worked with Carrie over the years and have had the privilege to really get to know her, both as her Real Estate agent and by her outstanding services as my insurance agent. Carrie is a dedicated hard worker who has designed insurance plans for my rentals, automobiles, and home. She does superlative work, has detailed knowledge, trustworthy and is always reliable. Carrie added a personal touch in helping me with all my insurance needs. I never thought of insurance as a pleasant experience, but let me tell you, this agency makes it! At other agencies I felt like they got me signed up, then I never really heard from them unless I contacted them. Not at Alan Galvez Insurance! They send monthly newsletters that not only help to remind you of what they can do for YOU, but answer your questions, offer tips and ask for your opinions! They also have customer appreication days, referral programs, and The Insurance Goddess. Where else can you get a Goddess that's there to serve you? I could go on and on, but it all boils down to honest to goodness great customer service, individualized and always ready to help. I have never felt so good about my insurance choice! Besides being a nice person, Carrie cares about people and her responsibility as an insurance provider. I've worked with her for several years and found that prompt accurate information was her forte. Carrie has been extremely helpful when I have needed assistance with home and auto policies. She is very personable and goes the extra mile to make sure that her clients are satisfied. Alan Galvez Insurance received a rating of 5.0 out of 5 based on 4 reviews on IWantInsurance.com.